Open chest wounds may be left open. Dress the wound (with a sterile pad, wrap, etc.) and apply direct pressure to stop the bleeding. Extreme care is required so the dressing doesn't become saturated with blood. Dress the wound appropriately and modify the procedure as needed. The patient should be observed for signs of pneumothorax (air in the chest cavity). It's a potentially life-threatening condition that sometimes develops with open chest wounds. If possible, check for signs of another open wound that may also be allowing air into the chest cavity if the injury involved an object that may have entered and exited the victim's body. Activate the Emergency Response System first. Check to see if there is more than one open wound that will need to be properly dressed. The dressing should only be applied if there is rapid blood loss. Remove clothing covering the chest, but leave stuck clothing. Cut the dressing and make sure it’s larger than the wound. Seal the wound to prevent the loss of blood and apply pressure if needed. Never remove objects from the wound. Wounds involving puncture of the skin can be severe. Care should be taken to prevent the puncture wound from becoming infected. If the wound has excessive bleeding, call 911 for specific assistance with how to proceed. Should the patient fall unconscious or be non-responsive without a pulse, call 911 and perform CPR. Apply thorough pressure (seek EMS attention if bleeding is excessive). Clean the wound thoroughly with water and soap (stay clear of the injury itself). Apply an ointment (such as Neosporin). Provide a pain reliever (e.g., Advil, Tylenol). Wrap the wound to prevent infection. Seek medical attention at the nearest hospital or urgent care facility if the injury worsens. Have the patient get a tetanus or tetanus booster shot. Amputations involve the accidental loss of one or more limbs. Due to the risk of severe blood loss, amputations should be treated promptly. Remain calm and describe the nature of the amputation to the emergency response operator when calling for assistance. If the patient isn’t breathing, perform CPR. Apply direct pressure. Raise the injured area. Use a tourniquet or tight bandage, if needed. If possible, clean the amputated part and make sure to keep it with the patient. Wrap the amputated part in a cloth and put it in a plastic sealed bag inside of a container of ice water. If the amputated part is below the heart, raise the legs 12 inches above the heart. Watch for any signs of shock. 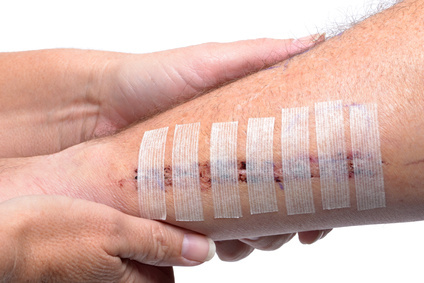 Cuts and scrapes can be minor or severe, depending on the specific trauma to the skin. Typically. the biggest concern with wounds of this nature is the bleeding. Apply thorough pressure (seek EMS attention if bleeding is excessive or the cut is deeper than 1/4 inch). Thoroughly clean the cut/scrape with water and soap (stay clear of the injury itself). Apply an ointment such as Neosporin. Wrap the injury to prevent infection. Seek medical attention at the nearest hospital or urgent care center if the injury worsens.